The Amsterdam Dance Event (ADE) is the gateway to the international electronic music scene. As Europe’s leading electronic music conference and the world’s biggest club festival, it’s the perfect time and place to meet up with international music minds, get introduced to an international audience and connect with new music, new trends and new people. Ever since I moved to Amsterdam, I’ve been looking forward to the third week of October. I remember sneaking into Dave Clark’s party in the Melkweg in 2007 and seeing Vitalic play together with Speedy J, nights I will never forget. I even got to know some of the most important people around me during this event. We at Overdose.am started getting involved with Amsterdam’s underground electronic music scene over a year ago when we started throwing our own events. This day and age, things moved fast and we’re very privileged to announce that we’re part of 2011’s ADE. Yup, we will be co-hosting the 2nd room of Marc Romboy’s Systematic Recordings showcase on Saturday the 22nd of October at the Chicago Social Club. Together with our friends of Electronation, Misc Agency and a line-up of 17 impressive DJ/producers this should turn out to be a hell of a night, lasting until 8 in the morning. If you’re not so familiar with Marc Romboy and his leading techno label, you might want to check out the recent video-interview we did with the man. 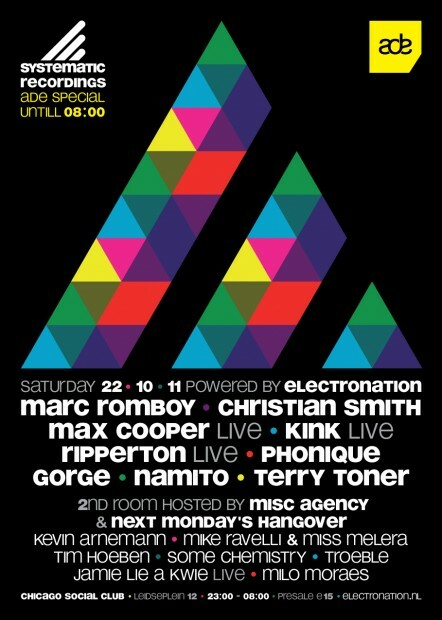 The amazing line-up Marc Romboy and Electronation invited to play features Marc himself, Christian Smith, Max Cooper (live), KiNK (live), Ripperton (live), Phonique, Gorge, Namito and Terry Toner, and this will be an ADE debut for Next Monday’s Hangover residents Some Chemistry and Troeble! Of course we don’t want our dedicated readers to miss out on our ADE debut, so we’re giving away 2×2 tickets for this special occasion. Comment on this post on Facebook with your favourite Systematic, NMH or Misc related song to win!